English: Time Magazine, a weekly newsmagazine. Time failed to renew the copyrights of many early issues. 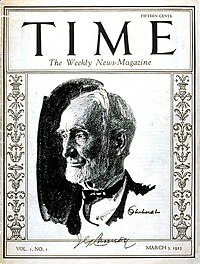 A search of the renewals for periodicals for entries for Time reveals that the publisher, Time Inc., started renewing the copyrights of Time magazine in 1962 with the 29 January 1934, issue. Therefore, issues that were published before 29 January 1934 are in the public domain. In addition, a few later issues were not renewed. All issues not listed in the table above had their copyright renewed, without exception. Note that works appearing in the public domain issues of Time may still be covered by copyright if they were published prior to their appearance in Time (with notice and renewal) or otherwise separately registered and renewed. s=Some of year's issues are copyrighted. c=All of year's issues are copyrighted. Diese Seite wurde zuletzt am 28. Oktober 2018 um 06:16 Uhr bearbeitet.